A hidden partition does not have a drive letter and it cannot be seen in Windows Explorer, thus operating systems cannot access it. Files in hidden partition are not lost, but they cannot be accessed in normal method. Step 1 Right-click on the partition you want to hide and select "Hide/Unhide Current Partition" option from context menu. Step 2 Click OK and the partition will be hidden. 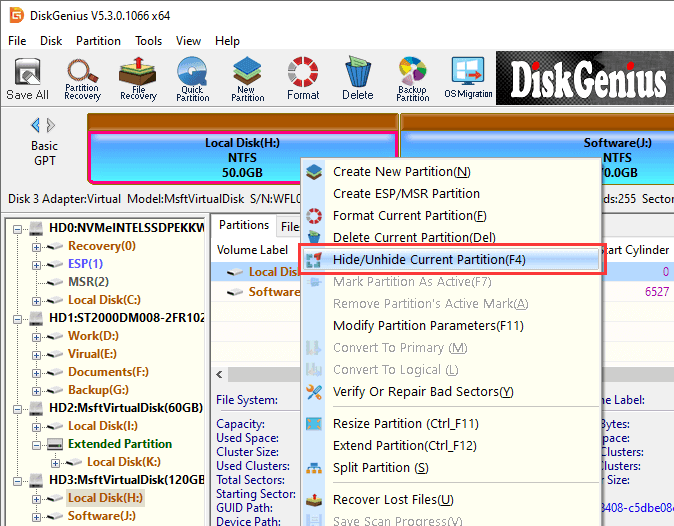 Though the hidden partition cannot be seen in Windows Explorer, you can use DiskGenius to access it. Step 3 Click Save All button to save changes to partition table. Step 1 Right-click on the hidden partition and select "Hide/Unhide Current Partition" option from context menu. Step 2 Click OK button when you see following message box. Step 3 Click Save All button to save changes to partition table. Then the partition will be assigned a drive letter automatically by operating system and you can see it in Windows Explorer again.